We are entering the home stretch of marathon training! With the Rock n Roll Marathon just 4 weeks away, our runs have really gotten up there in mileage. Last week’s schedule included an 18 mile run. Unfortunately a wedding and mother’s day prevented me from joining my usual VAVI Running Club crew this weekend for the run. At this point these super long marathon training runs are very important and I just didn’t want to miss it. Luckily Mike, the wonderful boyfriend that he is, agreed to run the 18 miles with me after work on Friday. My boss, who is a runner herself, agreed to let me leave work at 2 p.m. so that we could start our adventure as soon as possible. La Jolla Cove – Seals, Snorkelers & Kayakers! By the time we both got home, changed, got our fuel together, drove through traffic to La Jolla (well pretty much Bird Rock) and stretched, it was 4 p.m. Luckily the weather cooled down a bit, although it was still warm and about 70 degrees when we began. We started about 1 mile south of La Jolla Cove, and ran through the residential neighborhood until we reached it. The La Jolla Cove is one of the most beautiful spots in San Diego. 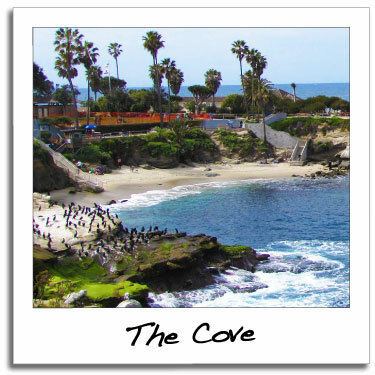 It is also one of the largest tourist attractions in San Diego, as the gorgeous cove is perfect for kayaking, snorkeling, sunbathing and picnicking. We ran right past the malodorous seals sunbathing on their favorite rocks, a large group of kayakers just entering the water, and several snorkelers. This mile was pretty slow going as we were dodging people and cars left and right. However, it was highly entertaining! Next we ran right past the park where the finish line of the La Jolla half marathon takes place and up the very steep cobblestone road nearby, we followed the streets until we reached La Jolla Shores. La Jolla Shores is a beautiful beach that is also the point where many scuba trips begin. 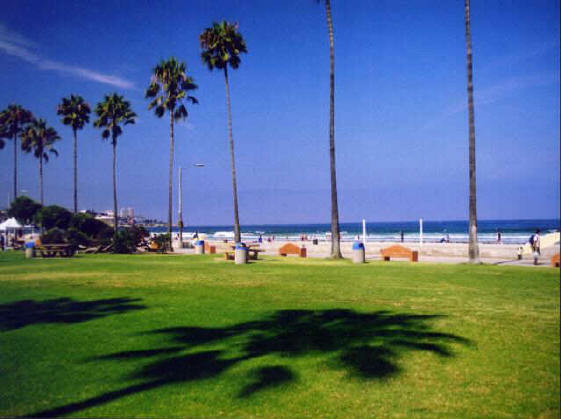 There is a grassy park that runs parallel to the water called Kellogg Park. We ran right past a group of scuba divers who were just getting out of the water from an afternoon dive. Whereas the Cove is more of a park community, the Shores is where people go to sunbathe and play beach volleyball, and today was a busy day on the beach. We ran right down the boardwalk until it ended and then began our ascent up the backside of Torrey Pines hill. At this point I made a reference to P90X Plyometrics. After the Gap Jumps, Tony says “Isn’t this fun! ?” and then “Fun’s over!” right before he announces it’s time to start the Squat Jacks (which is one of the hardest moves in my opinion!). We’d had so much fun people (and seal) watching during the La Jolla Cove & Shores portion of the run, but I knew that we had a massive climb ahead of us. This climb is actually the very steep descent that we experienced just weeks earlier during the La Jolla half marathon. The 460 foot climb is about 2 miles long. Needless to say, I was panting by the time we reached the top! However, I didn’t stop despite the burning in my legs and lungs. While running up the hill, we passed the Scripps Institute of Oceanography and the Birch Aquarium. There were also some epic glimpses of the ocean. Toward the top of the hill and for the entire flat portion before we entered Torrey Pines National Park, we ran through the UCSD campus. Mike actually attends UCSD as a MBA student, so it was kind of cool to include that on our epic run as well. We passed several students getting out of class. This was the point where I started getting low on my 16 oz water bottle that I’d been carrying. I also realized that we were already at mile 6 and I better take a GU before I ran out of steam. I had carbo-loaded pretty heavily that morning with bagels, so I definitely wasn’t hungry but I knew that my body would thank me for ingesting the caffeine-filled pick me up. I took the GU with the rest of the water in my bottle just before we reached Torrey Pines Golf Course. Torrey Pines Golf Course is arguably one of the most beautiful in the world. It sits atop a cliff overlooking the ocean. In 2008 I was lucky enough to watch Tiger Woods win the U.S. Open here. According to Wikipedia, on weekends, individuals arrive as early as 6 p.m. the prior night to get in line for the first come / first serve tee times that are given out from sunrise till the first reservations at 7:30 a.m.
Next we entered Torrey Pines State Reserve, one of the largest stretches of land on the Southern California coast. There are 8 miles of trails within the park; however, as runners, we take the main road which is actually accessible by cars. Bikers tend to use this road as well. The portion of the reserve that we use to run on is only 2 miles long, but it is very steep. 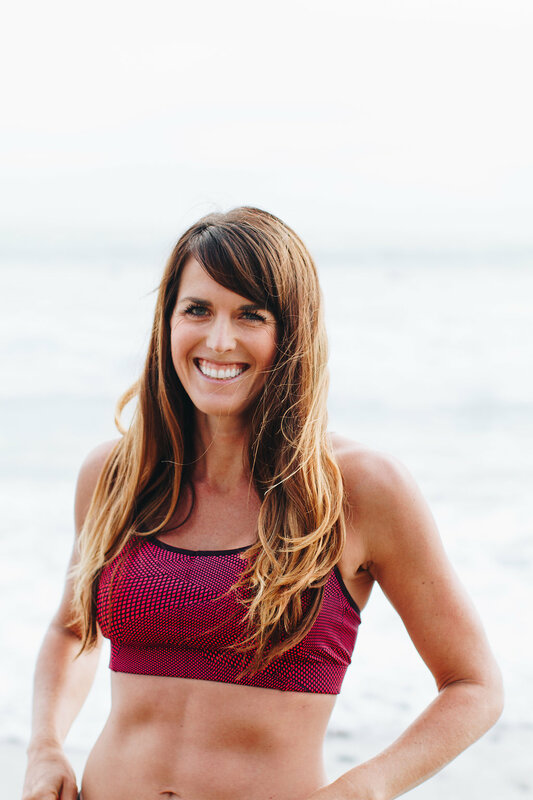 It is the equivalent of the Boston Marathon’s “Heartbreak Hill” for the La Jolla Half Marathon in San Diego. By looking at my watch, I knew that by the time we reached the bottom we’d be about halfway through with the run – 9 miles down, 9 to go! I also knew that there were water and bathrooms at the bottom of the hill. Mentally, it’s nice to know that you have a break coming. At the bottom of the hill we stopped and I filled my water bottle with 1 serving of Cytomax that I had stored in a zip lock bag. I mixed the Cytomax with water from the water fountain, took a few swigs of water from the fountain, stretched my legs and a bit and then we were off. Next we headed up a fairly steep hill and into Del Mar. 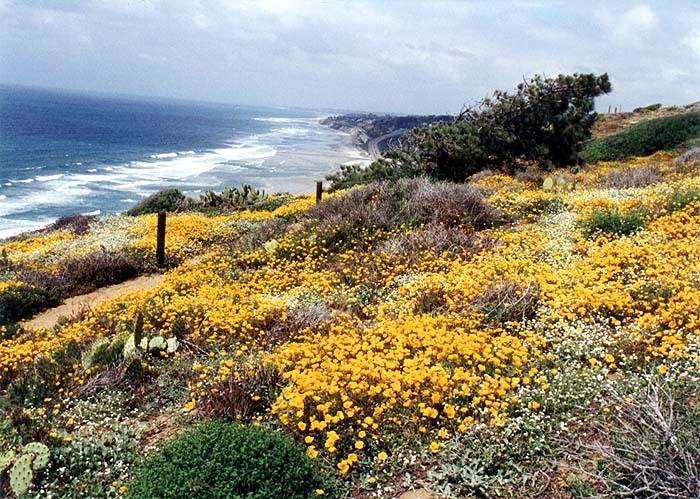 Del Mar is a gorgeous, high-income beach town with a very up-scale downtown area lined with expensive restaurants. We took the bike path trail at this point rather than going up the main road, the 101. As we passed the beach, we were stopped for a crossing train! We took this time to stretch a bit and drink some water. After we exited the trail, we ran on the sidewalk next to delicious restaurants such as Jake’s Del Mar and Poseidon. After a jaunt past the gorgeous Del Mar homes, we ran over the bridge that divides Dog Beach (since dogs aren’t allowed on most San Diego beaches there is an entire beach reserved for them and their owners!) from the Del Mar Fairgrounds on the other side. I laughed as we watched a dog swimming in the ocean water that was flowing inland on the east side of the bridge. The dog’s owner seemed totally fine wading and watching her pet doggy paddle itself into oblivion. We also enjoyed a gorgeous view of the Del Mar Racetrack, whose famous slogan is “Where the Surf Meets the Turf.” Mike and I got a group together to watch the races last summer and I actually won $27 off of a $2 bet! Not bad huh? I sure wish I had bet $200 though! Next we entered Solana Beach, a small beach community that is most well known for its row of antique, furniture and upscale clothing stores (and restaurants of course) called Cedros Design District. Cedros also is home to The Belly Up Tavern, a great music venue. 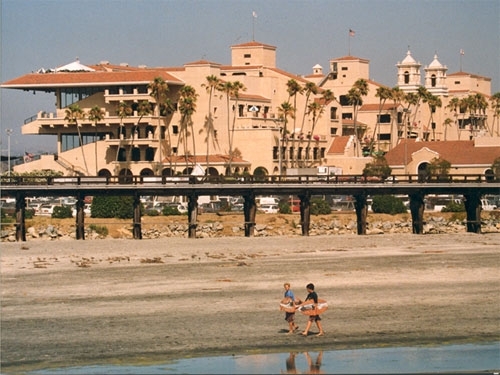 Solana Beach is also the location of the Amtrak station that our Vavi Running Club would be meeting at the following morning to begin their Train Run. Solana Beach has a gorgeous beach called Fletcher Cove. 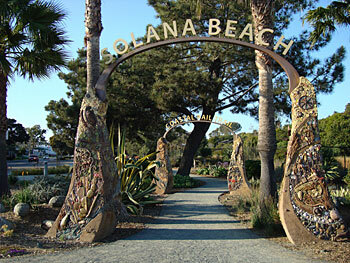 Fletcher Cove is the starting point of the Solana Beach Triathlon, which takes place every July. Last July I watched Mike compete in the triathlon and take home 4th place in his age group! I recently signed up for this triathlon – it will be my first tri-sport race! We ran down the “Rail Trail” off the 101 – a nice paved portion of sidewalk adjacent to the rail road track. We stopped at a water fountain on the side of the path we were running on and filled up our water bottles and took a Gu. We stretched a little bit but both decided it was best to keep going! 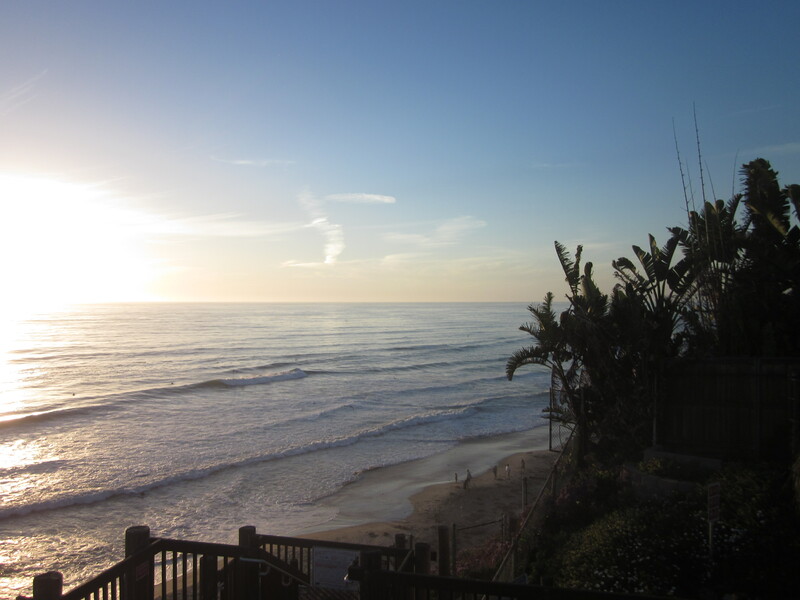 As you leave Solana Beach and enter Encinitas, there is an area of land called Cardiff by the Sea. We were running on the East side of the road and to the right a dirt path veered off to the right and into a huge field of yellow flowers. Mike suggested we follow it and I agreed that it would be fun to off road for a bit! We ended up running down the path for a bit before realizing that it veered into a gully and we had to take a side route that was much less traversed and therefore treacherous in order to get back to the road. Luckily we made it back without any sprains! 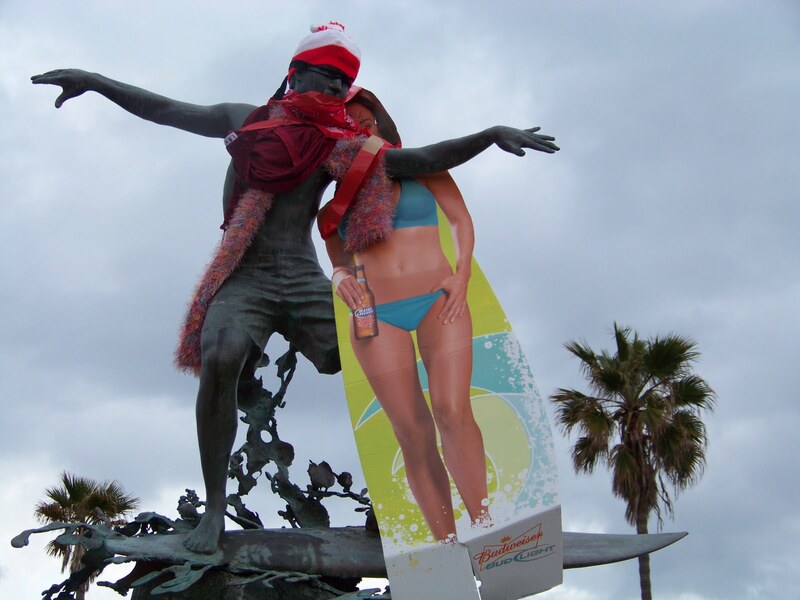 Cardiff Kook Gets All the Ladies! At this point, we were on “short run” territory. Oftentimes for my 6 mile mid-week run, I’ll run 3 miles south from our house and turn around. Since we were already running on this route, I felt like we were in the home stretch! The sun was beginning to set (unfortunately not a very colorful one but it was beautiful nonetheless). After we passed a few beachside restaurants, we approached the Cardiff Kook. The Cardiff Kook is a surfer statue in Cardiff that oftentimes gets dressed up in crazy costumes by the locals. During Christmas he transforms into Santa, Halloween a ghost, and basically takes on any character that is in the media at the time. During the Royal Wedding coverage, he was dressed as a bride. I saw someone post on Facebook that today he was dressed as Osama Bin Laden. I’m happy to report that I was feeling great at this point. I actually started picking up the pace pretty significantly. We had been running fairly leisurely, enjoying the sites and talking for most of the run. At this point though, I was ready to book it! We ran up into Encinitas, the city we live in, passing the campsites that line the beach and smelling the barbeques cooking dinner. We ran our usual back route through the houses, bypassing the 101 and its rows of shops and restaurants. We finished our run very strong and stretched out our sore legs at the gorgeous D Street Lookout point which is near Moonlight Beach, very close to our house. D Street Lookout – Our Finish Line! Our 18 mile run was surpisingly enjoyable. This weekend we are going for 21 miles. This time we’ll be running around Mission Bay and the San Diego Harbor. It should be another great run!